You've heard about the NorthWest Chocolate Festival, September 20-22, right? If you like chocolate, you should plan to be there. Go put it on your calendar. Yes, now. I'll wait. The festival has been expanding impressively these last few years, and is now held at Seattle's Washington State Convention Center. A little planning goes a long way. 1. Plan to be there. If you're anywhere near Seattle, do come. It's so worth it. The single day pass price of $30 (advance price) is both a bargain and a steal given what you get: samples of some of the finest chocolate in the world, multiple educational tracks, demonstrations, and performances. And the VIP pass is a great way to make it an exceptional weekend. My advice? Buy your tickets in advance. Either way, keep the weekend open. If like most Seattleites you prefer to keep your options open until the very last minute, that's fine; the at-the-door price will still be a bargain. 2. Expect crowds. Serious crowds. Especially if you go on Saturday. Sunday tends to be less packed. I like people but last year I got overwhelmed by the sheer number of humans around me. Toward the end of Sunday (festival is over at 5pm), everything started to clear out. My advice: if you can't wrap your head around sharing space with thousands of other chocolate lovers and their kids, go early or go late. Chocolate knows no off-hours but if you don't like crowds Saturday morning or Sunday afternoon are your best bets. 3. Getting there is half the battle. Street parking will not be any fun. If you drive, save yourself time and hassle and park in the garage WSCC for about $15 for 6 hours -- cheap if you carpool with your friends, who you know want to go too. Better yet, take a bus, bike, Car2go, or a taxi. Directions and parking info here. 4. Pack healthy snacks. You'll have the chance to sample enough chocolate to make yourself truly sick. Before you know it you'll be craving something healthy like carrot sticks, nuts, or cheese sticks. Yes, there are places outside the festival to eat real food, but if you're like me, you won't want to leave. So bring healthy snacks to tide you over until you can tear yourself away. 5. Pace yourself, both in terms of how fast you walk and how much you sample. I'm not kidding about making yourself sick. And if you have children with you (or adults acting like children) pace them, too -- we can all use help in the face of temptation. Too much dark chocolate -- and most of this will be that, dark, at 70% or better -- can bring you right over the line of your personal theobromine limit. At my first festival weekend I simply didn't sleep and it wasn't the minimal amount of caffeine in chocolate. It was the theobromine. 6. Taste, don't gobble. Take a tiny taste of even the small samples they give you, savor it, try to understand it, and save the rest of the bite for later. That way you won't overwhelm your taste buds as quickly and you won't hit your limit as fast. While everyone comes to the festival for different reasons, if yours include finding out what the big deal about premium chocolate is, what makes it different from what you can buy at a grocery store, you'll want to pay close attention to what your tongue is telling you. Take your time. 7. Bring easy-to-carry tote bags for the chocolate you'll be buying to take home. Most vendors are going to be selling their wares at low festival prices so this is the time to stock up for both your personal chocolate needs and holiday presents. Yes, properly stored bar chocolate will easily last until the holidays and well beyond and you'll want to carry your purchases comfortably through the day. I always bring something I can sling over my shoulder, like a backpack. And I wear comfortable shoes. 8. Bring water. There will be water at the festival, but bring a small container to call your own so you can have it when you like rather than needing to search. I always bring a thermos of hot water -- mild green tea, if you must know -- because chocolate melts at body temperature and it helps me clear my palette between tastings. This year I'll probably bring an even bigger thermos, even though I'll need to carry it around, because I tend to go through it all. 9. Take a good look around. There will be so much to do and learn at the festival that you could be overwhelmed, but instead think of this as a self-directed course in chocolate based on your specific interests. Look at the schedule, see what appeals to you. Watch demos, listen to talks by industry insiders, attend performances that intrigue you, or just walk the floor admiring confections. 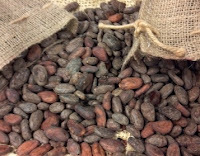 If you're like me, you'll be impressed at how interesting chocolate is, how it affects humans world-wide, and what the implications of theobroma cacao are for the earth's sustainable ecosystem. 10. Say hello! Talk to the chocolate makers, the chocolatiers, and the educators. Find out what they think the most important issues of the day are with regards to chocolate. Some of the most deeply passionate and knowledgeable people in the world and industry will be there, and they care very much about what you, the end-consumer, knows and understands about chocolate. Don't be intimidated -- just say hello! Got more questions about the festival? You might find the answers at the festival facebook page, or this FAQ. Now that's how to enjoy a festival! Dog lovers: Let's treat humans this well, k?